Farm Beginnings is the chronicle of a city girl starting to farm. Last installment Corinna spoke of clearing the land of trees. Today she speaks to chipping your own mulch. I learned the difference between “gym fit” and “farm fit” this weekend. I am barely gym fit and I am nowhere near farm fit. 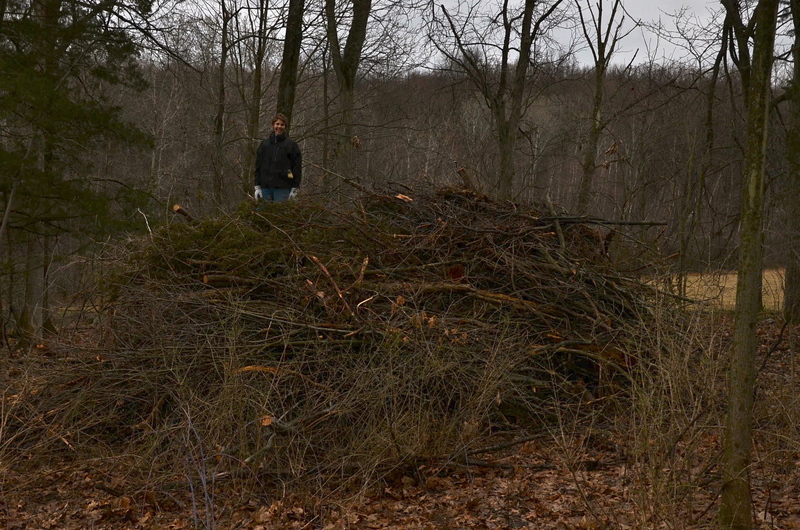 Standing on top of the brush pile at the beginning of the weekend. Imagine a pile of twisted laundry – except that it is made out of various logs and twigs, heavy, full of splinters, and 9 feet high and 12 feet wide. Imagine dismantling that pile in order to hoist the heavy wood to a machine that is fearsome in the Fargo sense of the word. The machine grabs with its dual rotating jaws the edges of 10 inch wide logs, small twigs, or entire cedar trees. The log that we were barely able to manuever is devoured like a teenage boy inhaling a piece of pizza. Oh and make sure to get out of the way – as the log enters the mouth of the machine, it will twist and move, so any branches that are still attached will whack you on the way in if you stand too close. Laying out the brush the morning of the second day before feeding the machine. After two days of this task – here are my conclusions. Not counting our labor, we spent $600 on the machine (including delivery and fuel) for the weekend. We ended up with perhaps 10-12 cubic yards of mulch. In Rhinebeck, NY the village will deliver to mulch to me for $20 and each cubic yard is $20 – 11 yards at those prices would be $240. 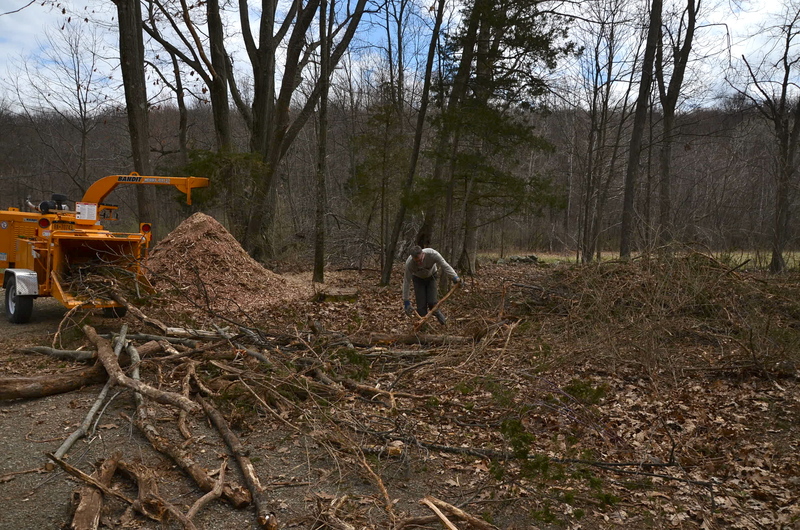 This entry was posted in On the Farm and tagged Corinna Borden, Farm Beginnings, Mulch, Real Time Farms, Wood Chipping. Bookmark the permalink. We have one Producer for our market who bought a small saw mill and uses what boards he can cut to build all the sheds on the farm. The rest he mulches. You go girl!!! Thanks so much WildRamp! I love your blog, the picture of the birds on the bike is awesomesauce!